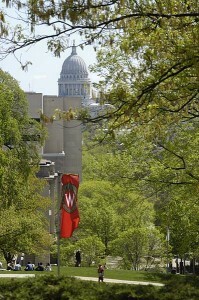 PROFS, a non-profit membership organization representing UW-Madison faculty, monitors legislation and lobbies the governor, members of the legislature, and members of Congress. PROFS has a long history of effectiveness – PROFS led the fight to ensure retirement contributions are taken pre-tax, saving the average faculty member about $1,800 per year and successfully lobbied for domestic partner benefits and first-day health coverage for faculty and staff. Recent activities at the state level are below. $82.5 million to be directed to meet outcomes-based goals set by the Republican legislature, including student success, workforce development and operational efficiencies. $25 million to be directed to improve access in high-demand fields in science, math, technology, engineering, health care and business. The Regents also approved a $1.9 billion capital budget request, including $90 million to expand UW-Madison’s Veterinary Medicine building. UW System’s budget request did not include a pay plan for faculty and staff. UW System President Ray Cross said he would ask Regents in December to approve a plan equal to twice the rate of inflation. The state budget process is lengthy and begins early next year when the governor introduces his budget proposal. The Joint Finance Committee and both houses of the state legislature must then approve the plan before it is returned to the governor for his vetoes and final approval. PROFS will actively monitor and participate in the state budget, meeting with key legislators and leaders from UW-Madison and UW System. Earlier this summer, both candidates for governor – current Governor Scott Walker (Republican) and Department of Public Instruction Superintendent Tony Evers (Democrat) – said they support an additional two-year freeze on University of Wisconsin System tuition, lengthening the current freeze to eight years. All Wisconsin Assembly seats and 17 seats in the Senate are on the ballot in November. Republicans hold comfortable margins in both houses, but some pundits believe the Senate could flip parties. A split legislature would have an impact on the upcoming state budget process and could slow Republican legislative efforts such as a proposed ban on fetal tissue research and campus carry.